On 25 March 1811, Percy Bysshe Shelley and his friend Thomas Jefferson Hogg were publicly expelled from University College, Oxford. On the following morning, after breakfast, they took their places on the outside of a London-bound coach. After only two terms as a first-year undergraduate, Shelley had been sent down. 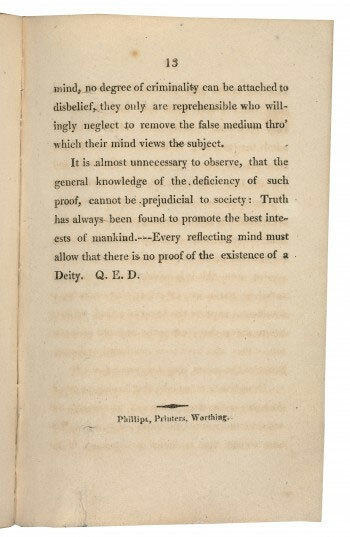 Their offence was ‘contumaciously refusing to answer questions … and also repeatedly declining to disavow a publication entitled The Necessity of Atheism.’ This was the anonymous pamphlet which Shelley had privately printed a few weeks earlier and put on sale at sixpence a copy in a shop-window on Oxford High Street. A passing don spotted the pamphlet and immediately ordered the stock to be burnt. Shelley had also sent copies out to individuals – ‘every bishop in the kingdom’, head of Oxford Colleges, and other dignitaries – with letters under false names, inviting their response. The reception from recipients was not rapturous. ‘A sixth enormous lie’, reported one of Shelley’s targets, ‘consisted in his saying [under the alias of Charles Meyton], that he had himself visited Palestine … and that neither angels nor martyrs should ever convince him, contrary to the evidence of his senses, that it had ever been a fertile land.’ The pamphlet, shockingly, contradicted the Anglican Church’s 39 Articles (‘There is but one living and true God …’), which Shelley and Hogg had signed only a few months earlier in the University’s matriculation register, on becoming members of the University. On the 200th anniversary of the expulsion, visitors to the Shelley’s Ghost website can see many fascinating items relating to Shelley’s time at Oxford and to his subsequent career as poet and unacknowledged world-legislator. The final page of The Necessity of Atheism is shown with its provocative ‘Q.E.D.’, concluding the proof of God’s non-existence. With a letter identified only in 2008, Shelley sends a copy to William Godwin, his future father-in-law, under the alias Jennyngs Stukeley. Another of his Oxford letters discusses ‘the Spirit of Love, the harmonised intelligence of infinite Creation’ – not to be confused with God. The draft manuscript of Mary Shelley’s Frankenstein is also on show, with echoes of Shelley’s anarchic behaviour at Oxford – chemical experiments, wrong-coloured pantaloons. Shelley’s Ghost is also open to visit at the Bodleian Library for just two more days until 5pm on Sunday 27 March 2011. This entry was posted in exhibition, expulsion, necessity of atheism, oxford university, shelley, shelley's ghost on 25 March 2011 by .